The first half of the Year of Science is complete. More than 2,000 students in 116 classrooms contributed 2.2 million words to Wikipedia’s STEM and social sciences topics. Wiki Education Foundation staff presented at and attended several events, including the Festival of Learning in British Columbia, the Wiki Diversity Conference in Washington, D.C., the American Astronomical Society conference in San Diego, and Wikimania 2016 in Italy. These events help strengthen our outreach to academics in the sciences as well as to the Wikipedia community as a whole. We’ve produced a streamlined Editing Wikipedia handbook for student editors participating in our Classroom Program. The new guide integrates and reinforces Wiki Ed’s online training resources, and includes information specific to Wiki Education supported courses. 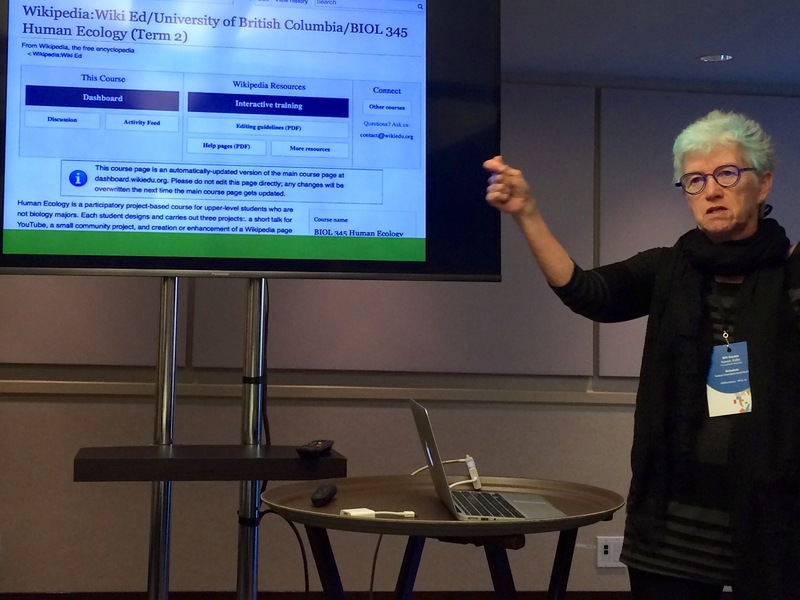 Dr. Rosie Redfield leads a presentation on teaching with Wikipedia at the Festival of Learning in British Columbia. In June, Educational Partnerships Manager Jami Mathewson presented at the Festival of Learning conference in Burnaby, British Columbia. She joined Classroom Program instructors Dr. Judy Chan and Dr. Rosie Redfield of the University of British Columbia to share student learning outcomes and the impact students can make to Wikipedia during an assignment. Wikipedia Content Expert Adam Hyland attended the Wiki Diversity conference in Washington, DC. Patti Provance joined Adam to represent the National Women’s Studies Association. The two shared the successes of our partnership and the impact women’s studies students are having on Wikipedia, bolstered by analytics from Kevin Shiroo (see below). 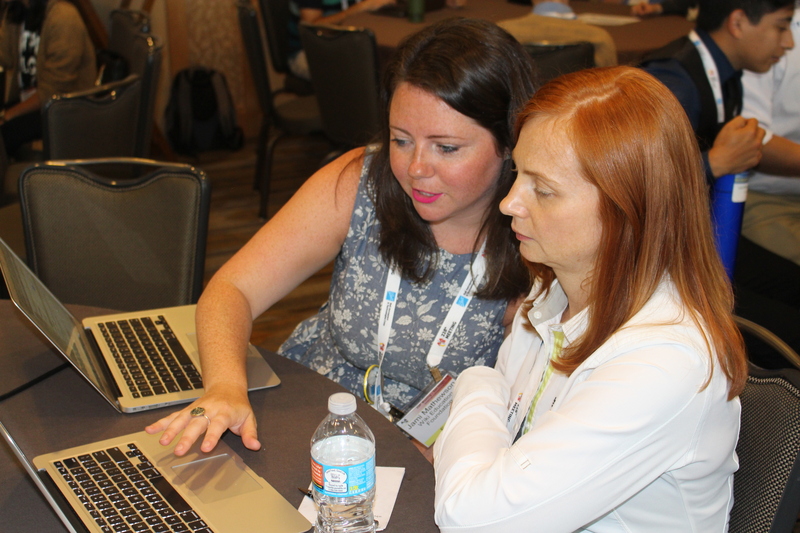 Jami Mathewson guides an instructor at the American Astronomical Society edit-a-thon in San Diego, CA. Outreach Manager Samantha Erickson and Jami attended the American Astronomical Society’s conference in San Diego, CA. They joined Wikipedia editor Emily Temple-Wood and Greg Boustead of the Simons Foundation to coordinate an edit-a-thon with astronomers at the meeting. Fifty-five people attended the event to learn more about editing within their field, and we started 28 new articles about women in astronomy! Jami remotely joined Dr. Alexandria Lockett of Spelman College and Dr. Jamila Lyn of Morehouse College for their symposium about integrating Wikipedia into writing-intensive courses. The event was funded by the Associated Colleges of the South (ACS) and brought together faculty from ACS institutions. Dr. Lockett and Dr. Lyn used this great opportunity to expose faculty to the diversity problems facing Wikipedia and to set a plan for empowering students to become a part of Wikipedia’s community. Samantha also gave a video presentation to a group of instructional technologists at Connecticut College. Read more about their efforts to engage instructors and diversify Wikipedia here. The Spring 2016 term’s numbers alone are cause to celebrate (more than 4,000 students from 215 courses), but is also a success based in quality and impact. Our students contributed almost 4 million words to Wikipedia during the Spring 2016 term. As a direct result of their work, the world now has better access to information ranging from political science to women and film and from biogeochemistry to the history of travel writing. Though we supported the largest number of classes and students yet, the term ran seamlessly. Classroom Program Manager Helaine Blumenthal, Samantha and Wikipedia Content Experts Adam Hyland and Ian Ramjohn coordinated their efforts to ensure that instructors and students alike received timely, relevant, and effective support. The end of the Spring 2016 term also marked the first half of the Wikipedia Year of Science. Well over half of the content our students added this term was part of that initiative. More than 2,000 students from 116 courses contributed over 2.2 million words to Wikipedia in the STEM and social sciences. Not only did roughly half of our students learn how to communicate scientific knowledge in a meaningful and impactful way, but Wikipedia now has better coverage of topics such as Cold War Science, Sociology, Paleontology, and Endangered Languages. We look toward the Fall 2016 term. We’re excited to continue the auspicious work of the Year of Science and see the Classroom Program continue to grow and exceed our expectations. The Spring term has shown us though that we’re prepared for this growth, and excited to embrace it. New features in the Dashboard made it possible to track the work of a student in Topics in Occupational Safety and Health who created Perda auditiva ocupacional on the Portuguese Wikipedia, a translation of the wikipedia:Occupational hearing loss article. Other students in the class expanded existing Noise and Occupational hazard articles. Students in Paul Sereno’s Dinosaur Science class did good work expanding articles about groups of dinosaurs that shared a common ancestor, otherwise known as clades. The Marginocephalia were a clade of dinosaurs that included the well-known Triceratops. Wikipedia had a Marginocephalia article since 2005, but it was only a single paragraph and two ancestral diagrams (cladograms) before a student editor from the class expanded it, adding seven paragraphs. Sections detail feeding, social behavior, sexual dimorphism, and locomotion. The Ankylosauridae were a dinosaur family whose best-known member was probably Ankylosaurus. A student editor in the class expanded the article substantially, expanding the anatomy and phylogeny sections and adding sections detailing locomotion, biogeography, variation, and lifestyle. Much like the Marginocephalia article, the Neosauropoda consisted of a single paragraph and a cladogram. A student editor in the class expanded the article, adding sections about the anatomy, evolution, and the history of discovery of fossils in the clade, and also added two cladograms. Other students in the class similarly expanded articles about the Dicraeosauridae, Eusauropoda, Stegosauridae, Saltasauridae, Megalosauridae, Brachiosauridae, Protoceratopsid, Genasauria, Tetanurae, Ankylopollexia, and Majungasaurinae during the month of June. Students in Naniette Coleman’s Sociology of Mass Media course at UMass Lowell are hard at work expanding Wikipedia’s coverage of the political theory, history, and practice of whistleblowing. Their expansions to Nuclear whistleblowers, Title IX’s whistleblowing protections (both on the main article and at sexual harassment in education in the United States) added important information on the topic, which has been covered sparingly on Wikipedia, even as high-profile whistleblowers receive high levels of volunteer attention. Students also contributed to an omnibus article on whistleblower laws in the United States, marked as needing attention since January of last year. We’ve reached the end of the first year for the Visiting Scholars program. Community Engagement Manager Ryan McGrady spent time this month collecting, verifying, updating, and organizing data about the program and its contributions. He will collate that data for a first-year program review report. A year’s worth of work produced by Scholars shows the impact that even a small number of experienced Wikipedians can have on public knowledge when they’re empowered by educational institutions and resources. June was our Scholars’ most productive month yet. That’s in part due to Rollins College Visiting Scholar User:M2545. In just under 3 weeks, she’s created 12 new articles and improved 36 others. She has also uploaded an impressive 226 new images to Wikimedia Commons, with several appearing in Wikipedia articles. You can read more about User:M2545 in the announcement of her position on our blog. We highlighted the work of Visiting Scholar Barbara Page in a recent blog post, UPitt Visiting Scholar is opening access to women’s health information. It discusses the work she’s contributed over the past year to improve women’s health articles through the University of Pittsburgh’s resources. The Visiting Scholars positions for Barbara Page and Casey Monaghan at the University of Pittsburgh officially ended in May. However, we’re pleased to share that all parties have agreed to continue their relationship for at least another term. In June, Wiki Ed launched its completely revamped Editing Wikipedia handbook. It’s a step-by-step guide for students assigned to write or expand a Wikipedia article with our program. Previously, we’d mailed copies of a handbook intended for a general audience of new editors. This guide focuses explicitly on what students need to know, heading off the challenges we know students typically face. It also complements Wiki Ed’s online training tools, directing students to appropriate training modules for each step of the assignment. Communications Manager Eryk Salvaggio also set up an interview with the Washington Post’s Caitlin Dewey for an article, “The surprising reason some college professors are telling students to use Wikipedia in class.” This was a major media piece which was picked up and republished in many markets, including the LA Times, NY Post, and more. Why some professors are telling students to use Wikipedia Caitlin Dewey, Chicago Daily Herald (June 26). The surprising reason some college professors are telling students to use Wikipedia for class Caitlin Dewey, Mineral Daily News Tribune, (June 27). Our main focus for digital infrastructure this month has been to clean up and consolidate the style standards of the Dashboard. We’ll begin a “living style guide” to standardize the common design elements. This will make it easier for new developers to begin contributing to the Dashboard, and it will help us to maintain design consistency as we build features. We’ve also fixed a slew of bugs and design inconsistencies, and improved the reliability of the Dashboard’s automated tests. With financial support from Wikimedia Foundation, Product Manager, Digital Services Sage Ross and WINTR developer Matt Fordham built two new Dashboard features: Available Articles and the Universal Language Selector. The Available Articles feature — accessible from the ‘Articles’ tab of a course page — lets instructors compile a list of Wikipedia articles without assigning them to individual students. This will make it easier for instructors who create a list of recommended topics for students to choose from. A student can click an article from the list to select it as their assignment. The Universal Language Selector — a feature that is now available on the Programs & Events Dashboard alpha test site — lets users select their preferred language using the same well-tested interface as on Wikipedia. Sage attended Wikimania 2016 at the end of the month. Wikimania provided a chance to collaborate in person with many of the global volunteers and Wikimedia Foundation staff who are interested in using and building our Dashboard system. The end of June also marked the end of our contract with Seattle design and development firm WINTR; for the next fiscal year, we’ll be primarily be developing new Dashboard features project-by-project as funding becomes available. We’ll be working throughout the summer to update the dDshboard assignment creator and training content for the fall 2016 term. This month, we looked at how much content Wiki Ed has contributed to Women’s studies articles. We wanted to see if our NWSA partnership has made an impact on those contributions. To measure it, we defined “women’s studies” as a set of WikiProjects. Those are groups of volunteers who share an interest in improving a common topic area. We identified the pages those “women’s studies” associated WikiProjects considered within their scope. Among all women’s studies content added to Wikipedia, the portion contributed by Wiki Ed’s students grew by 8%. That went from 4.0% of overall contributions to 4.3%. That was due to a 25.7% increase in general editor activity during the same time. So our students contributed more content, but so did the general volunteer base. That’s a positive signal for the gender gap. It shows that there’s increased coverage coming from Wiki Ed, but also outside of it. Between Fall 2015 and Spring 2016, we noticed a significant drop in students’ online training completion rates. The share of students who completed the training dropped from ~75% to ~45%. We had shifted from a longer, all-inclusive training to a training that staggered modules throughout the term, teaching specific content when students needed it most. After extensive analysis, we determined that there were multiple causes behind the drop. First, the change in our tracking design caused a change in measurement. That produced deceptively low completion rates. When we considered module assignments individually, completion rates are at 65%, much closer to previous figures. The majority of assigned modules are completed. However, we do observe a negative relationship between a modules position in the course timeline and the likelihood of the module being completed. Those that take place later in the term are less likely to be finished. This relationship persists even after controlling for students who drop the course. 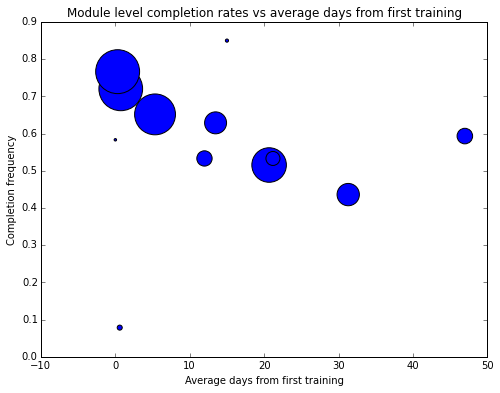 The graph above plots the average due date for a given module against the frequency that the module is completed. The size of the circle represents the number of students’ assigned a module. This shows a clear negative relationship over time. These insights are leading to changes in how we assign training modules. This month, we started work on a tool that will identify articles as being related to either pop culture or academia. Our end goal for this tool is to filter articles and reveal deeper insights into Wiki Ed’s role within the larger Wikipedia community. We think students are making large contributions to academic content areas (rather than pop cultural ones), but in order to validate that we have be able to sort through the work contributed by the general community more effectively. So we’re building a labelled data set of articles using Wikipedia’s labelling infrastructure. This data set will then be fed into a machine-learning algorithm and, after appropriate evaluation, we’ll use it to apply labels to unknown pages. Then, we’ll be able to measure our impact on academic articles compared to pop culture articles. 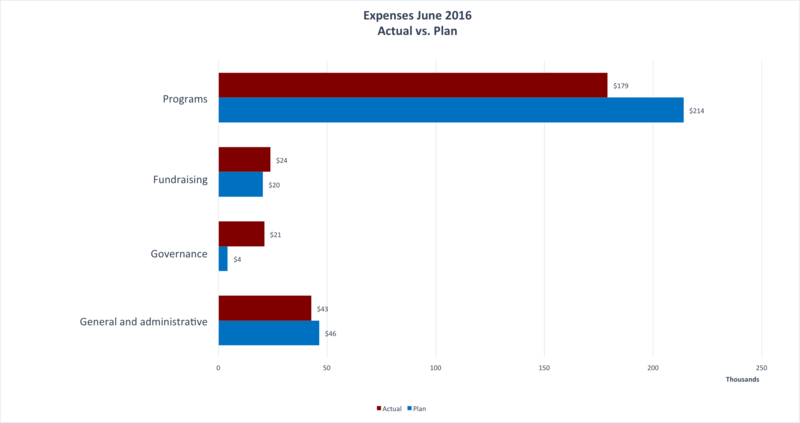 For the month of June, expenses were $266,775 versus the plan of $285,007. The variance of $18k is mainly due to our decision to hold off on expanding staff and office space. The preliminary expenditures for FY 2015-16 were $2,940,255 versus the approved plan of $3,679,246, resulting in a variance of $739k. Approximately 93% of the variance is due to our decision during the year to hold back on planned expenditures until we had a clearer picture of what our long-term funding would be. The remaining 7% was a result of savings due to unused funds or prudent spending. 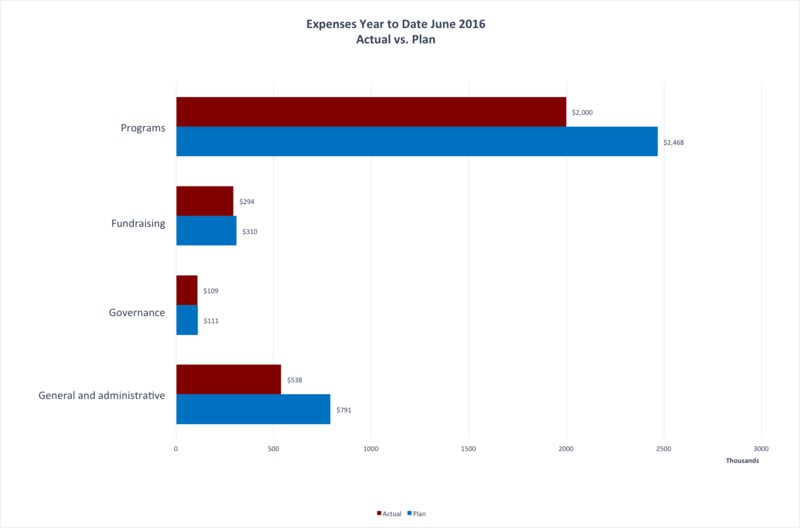 Our expenditures for the year were approximately at 80% of our planned budget. As June is our year-end, these numbers are preliminary and pre-audit. Although no major adjustments are expected, ongoing year-end analysis and audit preparation will likely have some effect on these numbers. 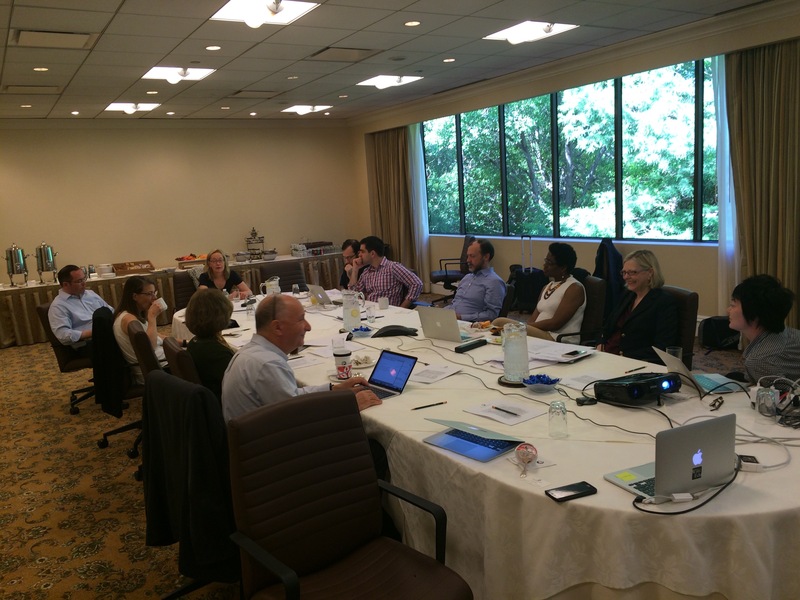 June kicked off with the Wiki Education Foundation Board meeting in Houston. The Development team planned a breakfast to leverage the Board’s strong Houston presence and contacts. Board Chair Diana Strassmann, along with Board members Karen Twitchell and Karen George, invited their Houston contacts, who attended the June 3 breakfast along with Executive Director Frank Schulenburg and Senior Manager of Development Tom Porter. The cultivation event resulted in several gifts of support and netted one new Classroom Program participant, who will teach in the spring 2017 term. The small, intimate setting of the breakfast proved a highly successful cultivation tool. As a result, we are optimistic about the possibility for building a strong base of support in Houston. Gifts earned at the Houston event were matched by the Stanton Foundation as a dollar-for-dollar challenge grant. In total, the Stanton Foundation generously donated $34,154 as part of the match program during the month of June. Tom also attended the American Astrological Society (AAS) Conference in San Diego in June, with Greg Boustead from the Simons Foundation. In June, Frank attended the board meeting in Houston, presented the annual plan and budget for next fiscal year, and engaged with the board in conversations about the current status of the organization and the time ahead. After the meeting, Frank followed up with attendees of the Houston fundraising breakfast, and discussed opportunities for supporting Wiki Education Foundation’s work. Frank also worked on different aspects of the upcoming all-staff meeting in July. He engaged with an external consultant to provide team-development measures, started to work collaboratively with Director of Programs LiAnna on the agenda for the meeting, and developed a plan for team activities around the topics “leadership across all levels” and “resilient organization”. Also this month, Frank created a new “Executive Director’s Summary Report” that will increase the senior leadership team’s effectiveness in keeping track of organizational performance indicators on a monthly level. Frank engaged with the board on his own performance review for the past year, including a self-evaluation and feedback from the other members of the Wiki Education Foundation’s leadership team. Furthermore, Frank set up an improved hiring process that will allow us to better track and document each step along the way. Frank met with board candidate Ted Yang, introduced him to staff, and discussed the current status and the future of the Wiki Education Foundation. Shoshana Grammer and Craig Hightower, Campbell & Co.